Chinese handset manufacturer Xiaomi has created a lot of publicity using a technique known as "Hunger Marketing". By offering a limited number of devices at a time, a phone is hyped and then sells out online within seconds. We've seen Xiaomi use this technique countless times and last year it sold out 200,000 units of its M2S in just 45 seconds. Now, some of the larger firms in the country are trying the same technique. 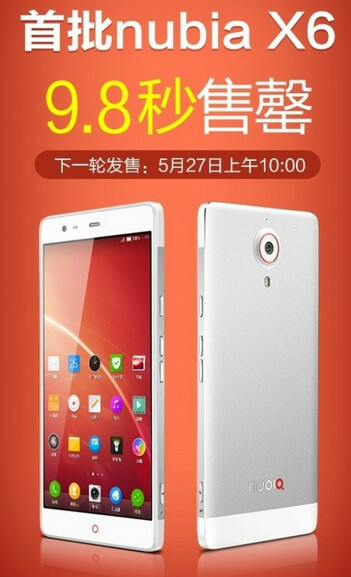 ZTE has announced that it sold out the first batch of its phablet, the ZTE Nubia X6, in only 9.8 seconds. The manufacturer did not announce the number of units involved, which leads us to believe that it probably wasn't a huge number. The ZTE Nubia X6 is equipped with a whopping 6.4 inch screen, with resolution of 1080 x 1920. In case you were wondering, that works out to a pixel density of 342ppi. The phablet is powered by a quad-core 2.3GHz Snapdragon 801 CPU with the Adreno 330 GPU crunching graphics. 3GB of RAM is included along with 32GB of native storage. There is no microSD slot on the handset. The back and front cameras weigh in at 13MP and the rear snapper includes OIS. A massive 4250mAh battery powers up the phone, which has Android 4.4 installed. The Phablet will be back up for sale on May 27 at 10am, but once again, sales will be limited to China. We also do not know how many units ZTE will have up for sale this time. Wow... Talk about vague......... We sold ?? phones in 9.8 seconds. Thanks for nothing. Even at 9.8 seconds, ZTE is far away from record. OnePlus One sold out in zero seconds. Wait... So you mean someone had a stopwatch when the sale began...! That battery!! With good software optimization, even with heavy usage, you can go 2 whole days without charging. And I thought 13MP on the rear camera was amazing...Most FFCs these days barely go past 2MP, so, to me, "impressive" is an understatement in my book. The phone itself has some nice specs, but 6.4" might be a bit too big for most people...then again, phones are growing in size these days. u sure their server can handle such heavy traffic? Now that battery sounds amazing!